The delightful city of Norwich, county town of Norfolk, has had an interesting past full of history and drama. For 120 years Norwich was famous for making chocolate, which ended when Nestle took over Rowntree-Mackintosh in the 1990s. Taking driving lessons in a city can seem quite challenging, and you may feel like reaching for some chocolate afterwards! But rest assured that all our Ignition Driving School driving instructors know the road systems around Norwich and understand where to take you to get the most out of your driving lesson. 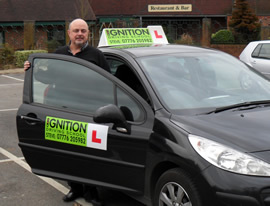 Ignition Driving School is proud to have Steve on its team of fully qualified driving instructors. A local driving instructor, Steve also works flexible teaching hours to help you fit driving lessons in. Norwich has its own driving test centre and so once you are competent your driving tuition will centre around the Norwich test routes. My first lesson with Ignition Driving School was really good. I was made to feel at ease and felt comfortable. I was given clear and understandable instructions which were easy to follow. As my lessons progressed each week (1 hour a week) so did my skills and confidence. I was happy with how quickly I progressed each week. Within a few months I was encouraged to enter for my theory and passed second time around. A few months after passing my theory I booked my practical test and myself and my instructor Steve felt I was ready. Steve Lightfoot was an excellent driving instructor, extremely patient and flexible. He tailored each lesson to help me develop the skills I needed to pass first time. Highly recommended. I had already had two other driving instructors before I met Steve but hadn't progressed as far as I had wished. Steve, unlike the others, was very proactive and didn't spend ages showing you diagrams and talking you through it - instead practice makes perfect and he let you get on with it giving brilliant feedback and how to improve. Steve is a popular instructor on campus and I can see why. He takes you on different routes each time and the lessons are always interesting and varied. I would strongly recommend Steve. He was always on time, would always fit you in as he works evenings and weekends and is great value for money - apart from that he's just a really top bloke! And I passed first time woop woop!